Of all the commercial storage hoppers available, self dumping hoppers are the most adaptable, adjustable and easy to use. 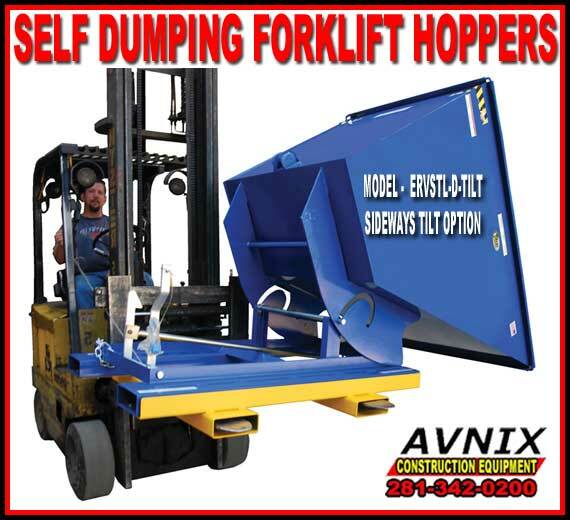 Avnix’s side self dump hoppers are made from heavy gauge steel, and works well in many industrial settings, from the small workshop to the largest warehouse or factory. Avnix’s self dumping hopper forklift attachment are indispensable on construction sites, where wood chips and steel off cuts, empty cement bags and other debris accumulates quickly. The easiest way to clean up the working area fast is with a self dumping hopper. Sideways Tilt Option, model D-TILT, can be used with D-75-LD and D-100-LD hoppers only. User must obtain written permission from fork truck manufacturer prior to use. Factory or field installed. May still use hopper like normal. Adds 3-1/2.” to height.